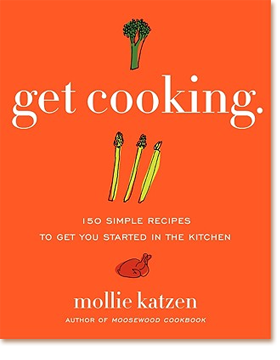 Mollie Katzen revolutionized the way America eats with her ground breaking best-seller, Moosewood Cookbook. Thirty-plus years and six million copies of her cookbooks later, she's still at it! In her new book, Get Cooking 150 Simple Recipes to Get You Started in the Kitchen, Mollie reaches out to cooks of all levels (including rank beginners), teaching everyone how to make great meals with affordable supermarket ingredients and easy-to-follow instructions that will get delicious results  as soon as tonight! Even the most inexperienced food lovers will have fun making easy soups, favorite pasta dishes, meat, potatoes, and vegetable sides  along with a host of Mollie's signature vegetarian entrées, burgers of all persuasions, impressive party snacks, and classic homemade desserts. If you're tired of pizza and broke from carry-out  and you just realized that after two hours of watching cooking shows on TV there's nothing to eat for dinner  this book is for you! Here's your chance to take charge and get cooking with terrific, economical options and a great new set of skills that can make you happier and healthier. * guides even the newest cook to exciting innovation through "get creative" suggestions at the end of each set of instructions. Illustrated throughout with Mollie's own color photography (she took a picture of each finished dish as she tested the recipes). The perfect cookbook to present to college students for their first apartment, young couples eager to cook dinner at home, or anyone who would like to do more in the kitchen than simply open a can of soup or zap something in the microwave. It's time to Get Cooking!